It has been called THE GREAT WAR and THE WAR TO END ALL WARS. We know it as WORLD WAR I. It began in 1914 and ended with an armistice at the eleventh hour of the eleventh day of the eleventh month in 1918. The cost…37 million casualties, including 117,000 dead and 205,000 wounded Americans. After war was declared on 4 April 1917 the U.S. began preparations to enter the morass of European trench warfare. In June 1917, transport ships carrying 14,000 U.S. troops in the American Expeditionary Force approached the shores of France, these soldiers would join the Allied fight against the Central Powers. They disembarked at the port of Saint Nazaire. The landing site had been kept secret because of the menace of German submarines, but by the time the Americans had lined up to take their first salute on French soil, an enthusiastic crowd had gathered to welcome them. However, the “Doughboys,” as the British referred to the green American troops, were said to be untrained and ill-equipped, untested for the rigors of fighting along the Western Front. 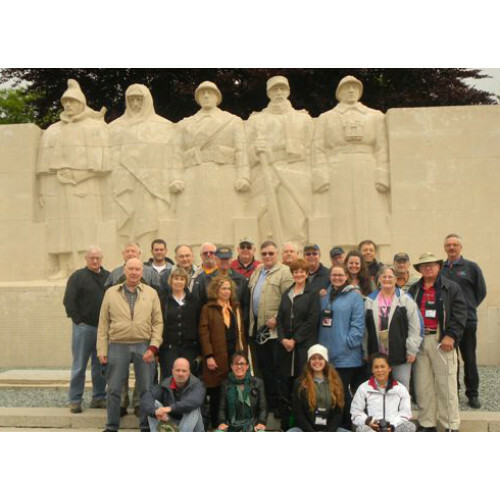 Our MHT Tour Leaders: James White is the son of noted WWI historian Col Bill White, USMC who originated this legacy tour for MHT and a WWI expert in his own right having done this tour multiple times and has extensive knowledge of the French WWI battlefields . Mark Typinski is a valued member of the MHT team. Mark served 10 years in the Marine Corps and is currently working for a government agency. His assignments have included embassy duty in Europe and the Middle East. He speaks French and is a dedicated student of WWI who has explored the WWI battlefields on foot many times. Airfare Not Included: Optional MHT Round-trip economy airfare from your hometown airport to CDG Paris available upon request (price subject to confirmation at time of booking.) Business class is also available. Fri 19 May (Day 1) Departure. Individual departures from USA to France. Sat 20 May (Day 2) Arrive CDG Paris. Group assembles at airport hotel. Early evening wine reception and tour overview briefing. Overnight: Paris CDG. Hotel: Paris Hilton CDG Airport. A note on Reims: Reims is an ancient city founded circa 80 BC. Consequently, time permitting, there are a multitude of cultural things we can do individually or as a group…Champagne cellars, the magnificent Reims cathedral and Eisenhower’s HQ where the Germans surrendered in 1945. An Optional Tour. We highly recommend the superb Museum of the Great War in Meaux, a 30 minute train ride from Paris, accompanied by one of your tour leaders. Open in 2011, it is an excellent museum that takes you through history from the roots of WWI in the Franco-Prussian War through the 1918 battles.